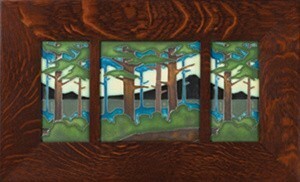 One 8" tile flanked by 2 4x8" tiles forms this beautiful triple landscape by Motawi Tileworks. Shown here in our own handmade quarter sawn white oak Legacy frame, in our Signature stain: hand selected to ensure the best finish, with a slight bevel to the molding to draw attention to the tile. Also available in our Oak Park style frame - now with dividers.